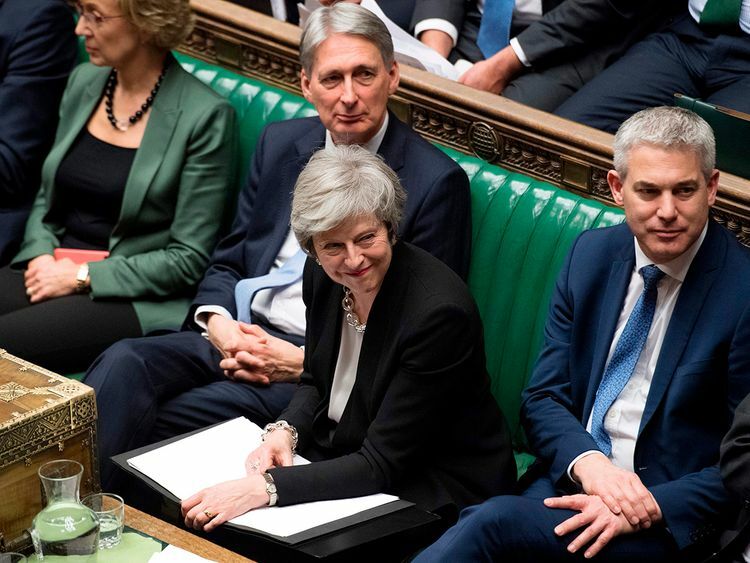 London: British Prime Minister Theresa May won parliament’s backing on Tuesday to renegotiate her Brexit deal — a major policy reversal that sets up a clash with Brussels just two months before withdrawal day. May’s dramatic decision to abandon a pact she herself sealed with the 27 EU leaders at a summit last month came with Britain on course to crash out of the bloc after 46 years in a blaze of political and economic chaos. The pound plunged on fears of a no-deal scenario as MPs voted through an amendment saying they would only support a divorce deal if the controversial “backstop” clause to keep the Irish border open was removed. A spokesman for EU leader Donald Tusk said the divorce deal was “not open for renegotiation” while French President Emmanuel Macron said it was the “best agreement possible”. MPs also backed a non-binding measure that carries no legal weight that “rejects the United Kingdom leaving the European Union without a Withdrawal Agreement”. But they failed to vote through a more important plan, backed by European supporters, that would have tried to force through a Brexit delay if no new deal with the EU emerged by February 26. May said parliament’s approval of the backstop amendment gave her the “mandate” to “seek to obtain legally binding changes to the withdrawal agreement”. After the parliament votes, opposition Labour party leader Jeremy Corbyn offered to meet with her so that an agreement can be reached that could “protect jobs (and) living standards”. Parliament on January 15 voted against the draft deal by a crushing margin. That significantly raised the risk that Britain’s departure without a plan on March 29 will create trade and economic disruptions on both sides of the Channel. Brexit hardliners from May’s Conservative party think the backstop — created to keep the border open with Ireland — could see Britain indefinitely tied to EU trade rules. The winning amendment backed by May calls for the backstop to be replaced with “alternative arrangements to avoid a hard border”. May’s already tried and failed to wrest new concessions from Brussels during a difficult summit last month that exposed her weak negotiating position — and the European Union’s resolve. EU Brexit negotiator Michel Barnier’s deputy Sabine Weyand on Monday remarked that the current political debate in Britain felt “like Groundhog Day”. Irish Finance Minister Paschal Donohoe on Tuesday said Ireland’s view was “unchanged”. “The withdrawal treaty containing the backstop must be maintained,” he said.